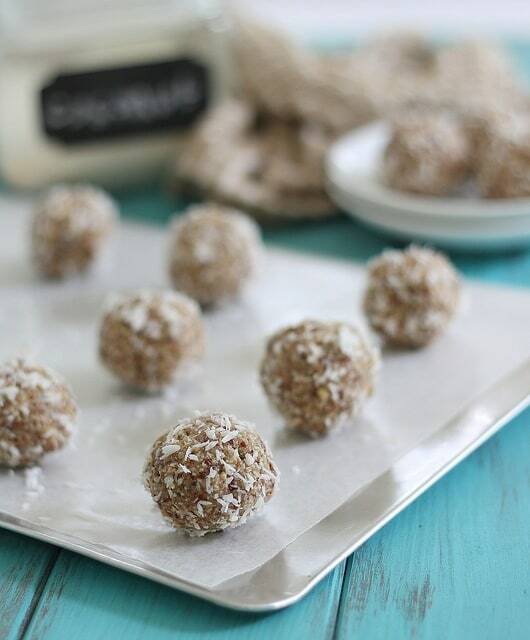 These coconut nut balls are perfect for on the go snacking and full of healthy fats and protein. Decadent enough for dessert, healthy enough for breakfast. It has been entirely too long since the last “ball” recipe graced this blog and what better time to bust one out than a 4 day jaunt to California this week? If I had to give this work trip a hashtag it would be #fueledbyballs. I’ve got 10 of these nutty delights individually wrapped and shoved in my bag for the week. A girl should never be without her balls. Eating healthy on the road is enough of a challenge. Eating paleo on the road is akin to trying not to be annoyed at the person in the seat behind you on an airplane using your seat as a punching bag for a 6 hour flight. So far, (1 day into this trip) I’ve spent $32 at Balducci’s in JFK purchasing a roast beef sandwich to dissect and use the meat on top of the $9 mixed greens salad, a fruit bowl for $6, a V8 (I’ve never had a legit, no fruit, just tomato, original V8 before yesterday. It was…interesting) and a 10pm second dinner of a meat + gauc + veggie bowl from Chipotle. It would’ve been way easier to grab a couple carb fest baguette sandwiches and call it lunch/dinner/second dinner like I normally would’ve and be done with the meals but I’m hanging on for the last few days of this self-imposed challenge (all bets are off in Italy later this month). 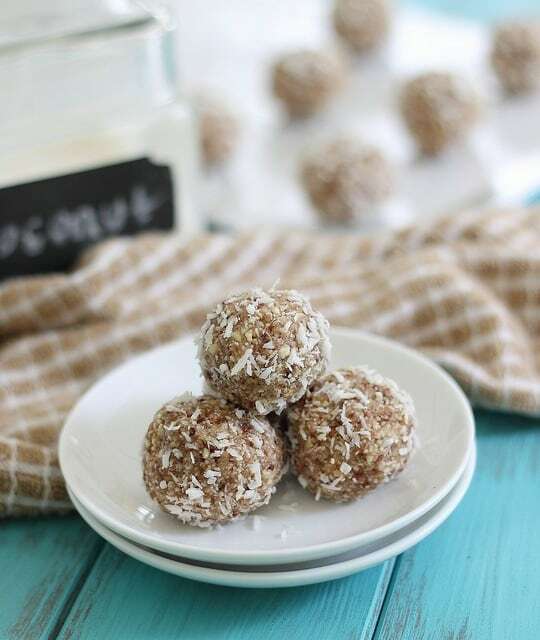 They’re paleo friendly, filled with nuts, coconut and coconut butter (alternatively named coconut crack in my house) and perfect for snacking. They were also made 1 hour before discovering the beetle infestation in the pantry. Thankfully, the beetles seemed to only be in the grain-like stuff, not the nuts. And if I’m wrong about that, they’re chopped up small enough from the food processor that I can’t tell and they happen to go really well with coconut. Combine all three nuts in a food processor and pulse a few times until they are finely chopped. 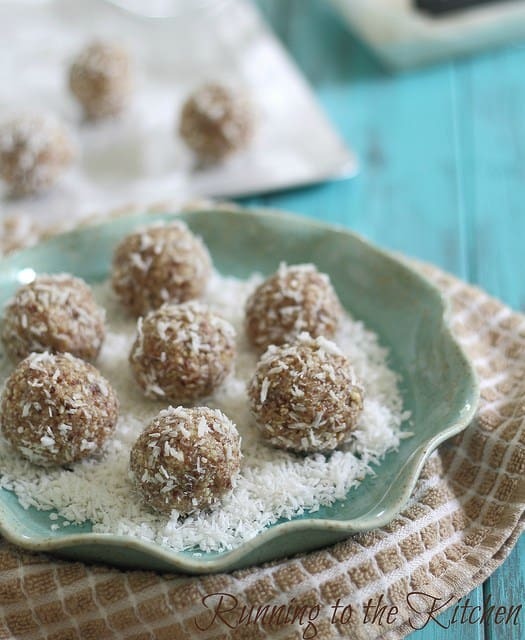 Add remaining ingredients (except additional 1/4 cup coconut flakes for rolling) to the food processor and process until the mixture comes together and starts to stick. This will only take about 1 minute. Transfer mixture to a small bowl. Pour remaining coconut flakes into a dish. 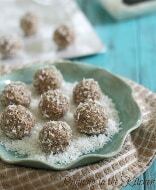 Roll nut mixture into balls using your hands then place in the dish and roll in coconut flakes. You can eat them as is or transfer to a parchment lined baking sheet and refrigerate to firm them up a bit. Once refrigerated for about an hour, they can be wrapped up individually for easy snacking. If you don't have coconut butter, use additional coconut flakes and a bit more honey. It just acts as another binding and sweetening agent. I love your balls! I made some balls yesterday and they were a little to moist!! Now I need to try your balls!!! I love coconut!!! Now, these are my kind of balls! I’ve been wanting to make a big batch of coconut butter for awhile now. Also, at 7:37 in the morning, I am now craving Chipotle… bet you didn’t mean for that to happen ;) Have fun on your trip!!! YUM!! It has been entirely too long since I have made some balls over here, too! :) I love all of the different nuts in here, I need to make some soon. Just out of curiosity is chocolate allowed on a Paleo diet? I honestly don’t know! I’ve eaten a few squares of dark chocolate a couple of times though ;) Sugar isn’t allowed so regular chocolate I know isn’t but maybe realllllly dark is fine? wishful thinking.. I just bought a bag of coconut with no real purpose…I guess I just found it! oh yeah eating ‘paleo’ on the road is always interesting. I pack hard boiled eggs and tell myself i’ll never see the strangers sitting next to me on the airplane again, and dig in. Desperate times. girl, i don’t know how you are doing paleo on the road…i would definitely have just given up for the day after the roast beef + salad thing! I literally want to cry and run into a hole every-time I read that beetle thing. I’m like shaking thinking about it. But, nut balls. That I can get on board with. Balls! Thank goodness. I was beginning to worry. I wish I loved coconuts! I feel like it is in a lot of paleo food. airport food is THE WORST ripoff $$ (I spent $6 dollars on one cup of coffee at the ATL airport last week and even told the Barista this better be the BEST cup of coffee of my life or I want a refund! and I wasn’t kidding; it wasn’t even that good but I drank it anyway). Not only is 3 pieces of old fruit in a cup like $7 bucks but anything fresh is super expensive and not even really fresh. Ugh. Good call on these balls! Nut balls. You’re my favorite person today! Paleo while traveling? Girl you are dedicated!! At least you have these yummy treats though! Coconut always makes everything look so pretty! I’m sad it’s probably the only flavor I’m not wild about. Eating healthy while traveling always feels ridiculously impossible. I definitely admire your commitment. And love these balls! I always laugh when I see more balls pop up. Have a safe trip! i know this is an older post but JUST made them and delicious! Been trying the paleo lifestyle and needed a sweet treat. After ten minutes in the freezer they were perfect! Thanks! Can you please tell me roughly how much protein per ball is in these? I need to know as I am measuring my macros and these look delish!! Hi Michelle- I don’t calculate the nutritional information for the recipes on here. If you’d like to so you can see how they fit into your macros, just plug the recipe into one of the online calculators. There are plenty out there that will do that for you.